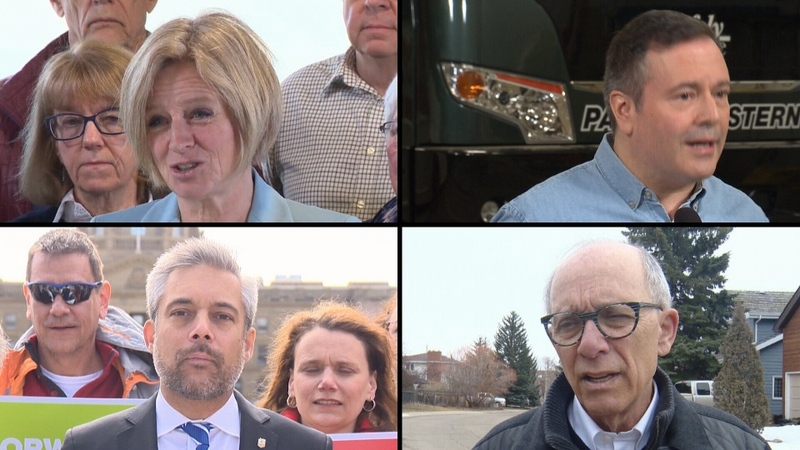 With one day to go before the provincial election, party leaders were out on the campaign trail highlighting their platform promises and making one final pitch to Albertans. NDP Leader Rachel Notley was at a pipeline construction company in Calgary on Monday, where she promised to fight for the Trans Mountain pipeline expansion. Her main opponent, UCP Leader and frontrunner Jason Kenney, was in Edmonton, where polls predict a comfortable lead for the NDP. Kenney, who addressed the RCMP raid of one of his candidates, continued to focus on the economy, jobs and the pipeline, and the importance to win seats in the capital region. “We want to make sure that there is strong Edmonton region representation around the table where decisions are made,” Kenney said. The Alberta Party is trailing in the polls, but its leader, Stephen Mandel, remains hopeful. On Monday, he continued to lament the “disconcerting” negativity created by the NDP and UCP, and his final message to Albertans before Election Day is about unity. The Alberta Liberals’ final campaign announcement involved a new strategy to reduce crime. Party Leader David Khan said his party would spend $10 million to hire more police officers, and increased support for neighbourhood watch groups. “We will address the root causes of crime: poverty and mental health,” Khan said. While polls are suggesting a big UCP win, one political analyst is expecting a close race. “In an election like this in close riding, every vote literally does count,” Lori Williams said.